REDEMPTION is back with yet another heart stopping, ground breaking underground Long Island event! 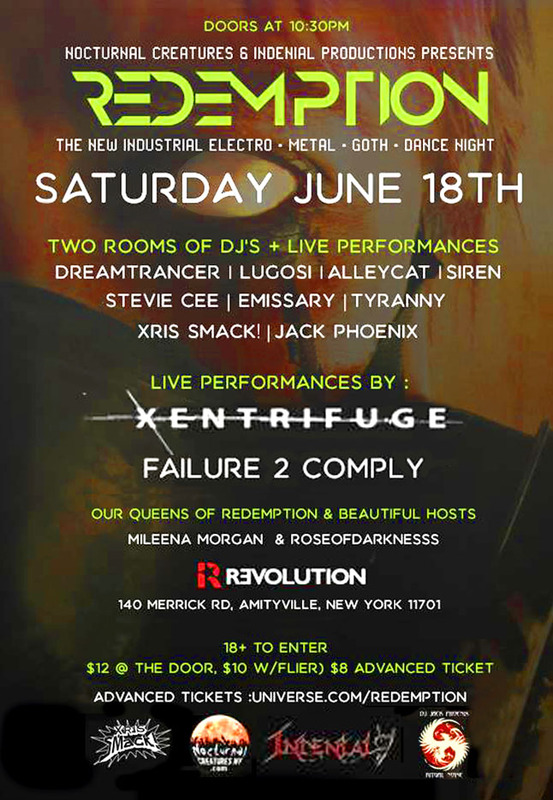 2 Rooms of cutting edge synth music, gritty Industrial & Dark Gothic Rock spun by your favorite DJs! Redemption is a party that most definitely lives up to it's name in helping redeem and bring back the underground music scene to it's former glory! So we call out to all the Nocturnal Creatures to come out and help us redeem our Underground Nightlife and live Indenial!!
" With influences stemming from early baroque to contemporary alternative electronic genres, fAILURE 2 cOMLPY bring you true-to-heart raw emotion, killer vibes and a heavy sound"
"From the NJ/NYC's Underground Music Scene comes Xentrifuge, a brutal assault of Harsh Industrial/Aggrotech, constructed by the collectively innovative minds of Chris X and Lisa Hellen. Xentrifuge brings a groundbreaking blend of Industrial-based sound, fused with noise, and a touch of heavy guitar work to create a hauntingly melodic, yet raw and unforgiving product."